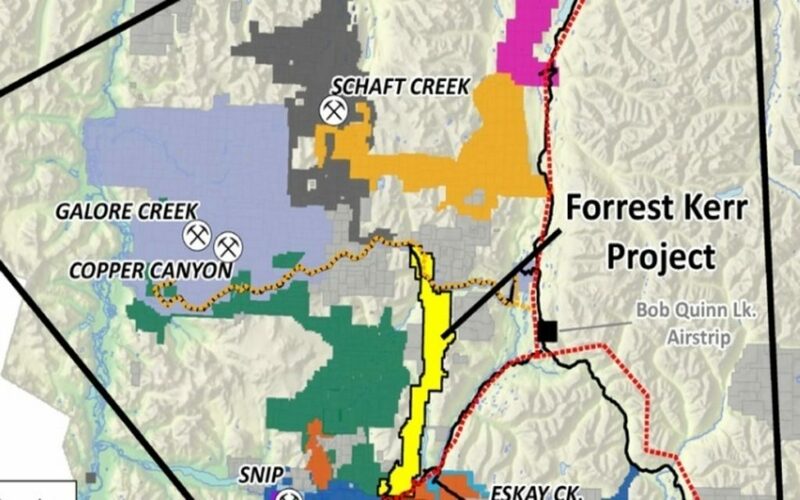 Aben Resources Ltd (CVE:ABN) (OTCMKTS:ABNAF) first 2018 drill results are out at the Forrest Kerr Project in BC’s Golden Triangle, and the results are material. The company posted significantly better mineralization at depth than in their previous go-around. A more favorable post-market reaction is sure to follow. The money hole in this equation is Hole FK18-10, the first of eight holes that have been drilled thus far in 2018. Of the eight holes, four separate high-grade zones have been determined, with the best zone returning and interval of 38.7 g/t Au over 10.0m including 62.4 g/t Au over 6.0m starting at 114 meters downhole. Furthermore, these high-grade zones and precious metal values were intersected at shallow depths, which is always desirable over deeper and less accessible vein structures. This new discovery is part of the Boundary North Zone and is 230m north of the historic high-grade drill hole drilled by Noranda Inc. in 1991. Investors may recall that last year, the hype surrounding the Aben Resources’ drilling program at Forrest Kerr faded very quickly—crashed in fact. After embarking on a large run (trough-to-peak run of about ↑450%) sparked by news of the company’s upcoming 2100 meter summer drill program on July 26, 2017, the rally ended with a thud after the initial highlight hole “only” returned 6.7 g/t Au, 6.4 g/t Ag and 0.9% Cu over 10.0 meters (Hole FK17-04) on October 4th. Shares were cut down ↓33.33% following the announcement, and cratered ↓66.66% over a three week period. The tables have certainly turned this time around. Currently, the stock is higher by $0.135 to $0.335/share (↑67.50%) in early trade. Whether Aben Resources goes on a multi-day tear akin to Sokoman Iron Corp. just days before it remains to be seen. 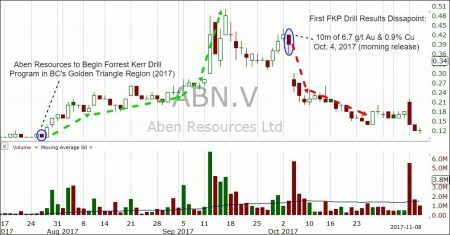 Aben is starting from a higher base, and perhaps the news is less unexpected coming from this well-known gold mineralization region. However, at over 6.4 million shares already trading hands by 10:17am, the market is clearly energized by these results. Volume is well on-pace to triple the stock’s record volume session of 6.67 million shares set back on September 12th, 2017. Such a phenomenon in generally conducive to significant price extension in the current session—and perhaps a few days thereafter.